LIFESTYLE BLOG|| JUICY JISTS|| NEWS|| EVENTS|| FASHION|| & GOSSIPS...SERVED ON A PLATTER OF GOLD. News Always Juicy! The Benin Zonal Office of the Economic and Financial Crimes Commission, EFCC, on Wednesday, October 18, 2018, arraigned one Akpan Monday James before Justice E. Nwite of the Federal High Court sitting in Warri, Delta State on a four -count charge bordering on fraudulent conversion and intent to defraud. One of the counts reads: "That you, Akpan Monday James on or about the 29 November, 2016 in Warri, within the jurisdiction of the Federal High Court of Nigeria , fraudulently converts to your own use the sum of Ten Million Naira (N10,000,000) only property of Africa Alpha Realization and thereby committed on offence punishable under section 390 of the criminal code Act , Laws of the Federation of Nigeria, C38,2004. The defendant pleaded not guilty to the charge when it was read to him. In view of his plea, the prosecution counsel, Immaculate Elody asked the court for a trial date and to remand the defendant in prison custody. However, attempt by the defence counsel, A.M. Oriahi to move an oral motion for bail was rejected by the court. Consequently, Justice Nwite adjourned the matter till 21 November, 2018 for hearing and ordered that the defendant be remanded in prison custody pending the determination of his bail. In a similar development, the Benin Zonal Office, EFCC, on Wednesday, October 18, 2018, arraigned Osaki Harry, David Woluchem and their company, Big Ideas Galleria before Justice E. Nwite of the Federal High Court sitting in Warri, Delta State on a two-count charge bordering on conspiracy to wit, intent to defraud and obtaining under false pretence . One of the counts reads: "That you, Osaki Harry, David Woluchem and Big Ideas Galleria Ltd on or about 18 August 2017 in Warri, Delta State within the jurisdiction of this honourable court did with intent to defraud induce Olufemi Talabi of Fota Energy Limited to deposit the aggregate sum of N7,550,000.00 only into account number domicile at Zenith bank PLC operated by you with the false pretence that you have 1000,000 litres of automotive gasoline oil (AGO) to supply him which pretence you knew to be false and thereby committed an offence contrary to section 1(1) b of the Advance Fee Fraud and other fraud related offences Act 2006 and punishable under section 1(3) of the same Act. The defendants pleaded not guilty to the charge when it was read to them. In view of their plea, the prosecution counsel, Udus Ugbede asked the court for a trial date and prayed that the defendants be remanded in prison custody. However, attempt by the prosecution counsel to I .F . Elema to move an oral motion for bail was rejected by the court. Justice Nwite adjourned the matter to 25 November, 2018 for hearing and ordered that the defendants be remanded in prison custody pending the determination of their bail. Karrueche Tran pictured with her mum Cindy Adamson. Another South African lady shares story of how she was almost killed by a man. Instagram Big girl Adeola Diadem is pregnant. Guy causes uproar when he shared a post about black women. Viral photo: Bride's friend held a sign showing where they met her. Eddie Murphy's arranged wife & queen in coming to America reappears in their famous outfits from the movie. When your find out his favouritefood is Okro. And I hope your are a part of it. 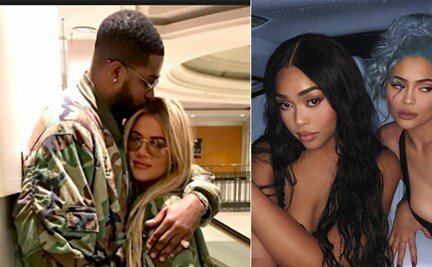 Real reasons Jordyn Woods fell for Tristan revealed. All rights reserved. Daminaj . Powered by Blogger.